It won’t be long before live music floods Downtown Lakewood, echoing through urban streets and beckoning families and concert-goers alike to the heart of the city. That’s because LakewoodAlive’s Front Porch Concert Series – sponsored by Bentley Wealth Management of Raymond James – is poised to return from 7 to 9 p.m. each Friday evening from July 1 through Sept. 9. 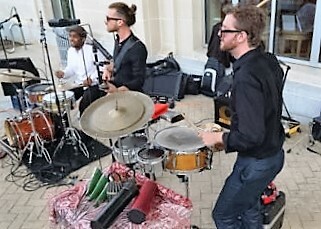 Like a crowd-pleasing encore performance, this summer series is sure to delight its audience, as it features a wide array of free, live music on the front porch of Lakewood Public Library (15425 Detroit Avenue) for 11 consecutive Fridays. The Havana Nights Orchestra kicks off the series with Cuban flair and salsa-style music that will heat up the summer evening on Friday, July 1. Now in its sixth year, the popular Front Porch Concert Series adds vibrancy and an enhanced sense of community to Lakewood’s urban core, drawing several thousand attendees annually. Each week showcases a different style of music while Lakewoodites and visitors enjoy an entertaining evening at an open-air venue. The popular summer concert series returns July 1. The 2016 edition of this summer series offers something for every musical taste. From folk to reggae to rock and roll, each weekly concert remains family-friendly while delving into diverse musical genres. Attendees are encouraged to bring family, friends, snacks, blankets and chairs. In the event of inclement weather, the affected concert will be moved into the library. In addition to title sponsor Bentley Wealth Management of Raymond James, Cuyahoga Arts & Culture, Lakewood Public Library, Lion and Blue, Paisley Monkey, Pillars of Lakewood, Vane Music Studios and the City of Lakewood provide sponsorship for LakewoodAlive’s Front Porch Concert Series. For more information, including the lineup of bands and musicians comprising the 2016 Front Porch Concert Series, please visit the LakewoodAlive website.